I used to work at a Middle Eastern bakery in Cambridge, MA. It was my first in-depth encounter with Middle Eastern cuisine, and I fell hard in love. My days were spent cutting chocolate hazelnut baklava, soaking revani in syrup, and making Turkish coffee. 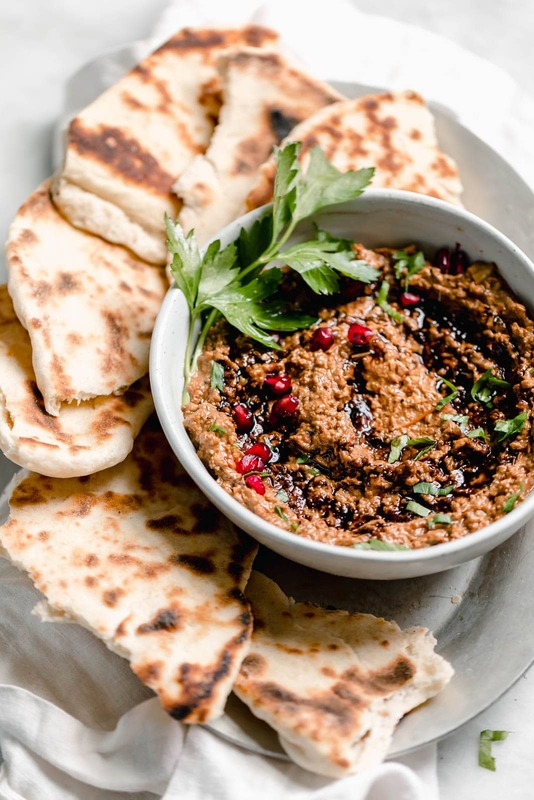 I’d cook giant batches of homemade chai syrup, snack on scraps of sesame cashew bars, and package up all types of mezze, or dips and spreads, for our take-home case. One of the highlights of my day was lunch, because I got to try alllllll of the delicious things. And though I made my fair share of rounds on the menu, I always came back to our mezze platter, an oblong plate with 5 rounded scoops of dips and spreads all made in house. There were at least 12 to choose from at a given time, but no matter what, I always made sure one of those scoops was muhammara, a roasted red pepper walnut dip. The combination of sweet and acidic red peppers, warm and nutty walnuts, and a hint of pomegranate molasses got me every time. And this is coming from someone who really don’t like roasted red peppers. In fact, I dislike very few foods, and roasted red peppers is one of them. But when blended with toasted walnuts, they take on a new flavor experience entirely. So when making my own muhammara dip recipe, I had high expectations. But thankfully they were exceeded, and this dip is a total winner. Roasted red peppers — For the best flavor, I recommend roasting your own red peppers. It only takes 30 minutes in the oven, but it makes this dip taste fresher and even more flavorful! I’ve popped instructions for how to roast red peppers in the recipe card below, but let me know if you have any questions about the process. Walnuts — Feel free to buy roasted unsalted walnuts at the store to make your life easier. Otherwise, you can toast raw walnuts at the same time you roast the red peppers (walnuts only need 8 to 10 minutes in the oven, though). The walnuts are crucial to this dip, as they add a subtly nutty flavor and are what make the texture of this dip so irresistible. Bread crumbs — This ingredient usually surprises people, but bread crumbs are non-negotiable in this easy dip recipe. The bread crumbs thicken up this dip and soak up some of the extra liquid released from the red peppers. If you’re gluten-free, it’s totally fine to use gluten-free bread crumbs! Pomegranate molasses — This tastes nothing like the molasses you use in gingerbread cookies. 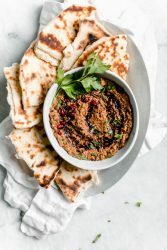 Pomegranate molasses is sweet and incredibly rich, so you need only a few tablespoons for this muhammara dip. Fresh lemon juice — The key thing to remember here is fresh lemon juice. Lemon juice brightens up this dip without making it taste lemony and adds another layer of flavor that will have you going back for seconds. 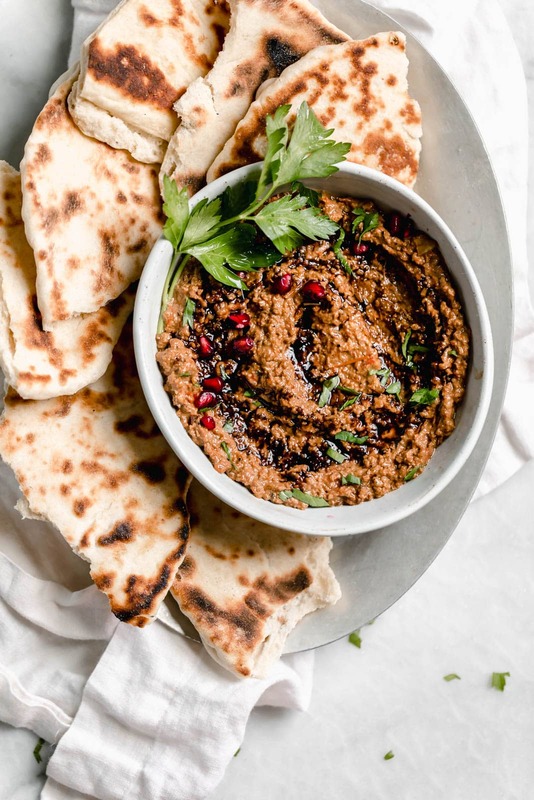 I love pairing this muhammara dip with my 5-minute homemade hummus, some nutty cheeses, and crackers. 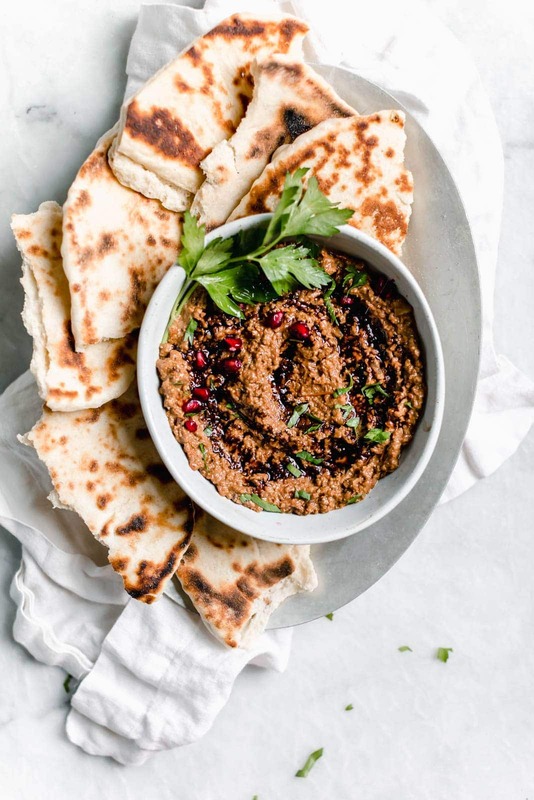 It also tastes amazing with warm slices of pita bread or alongside a raw veggie tray (soooo much better than the usual ranch dip people serve with vegetable trays). It makes for a perfect no-cook meal that you can enjoy any time of the year. And it makes for a unique app to bring to parties, too. This red pepper walnut dip can be made in advance and keeps well in the fridge for a few days. Just make sure it’s in an airtight container when you store it! Give the muhammara a good stir before serving it in case the oil and lemon juice has separated. Hope you guys fall in love with muhammara as much as I did! XO! 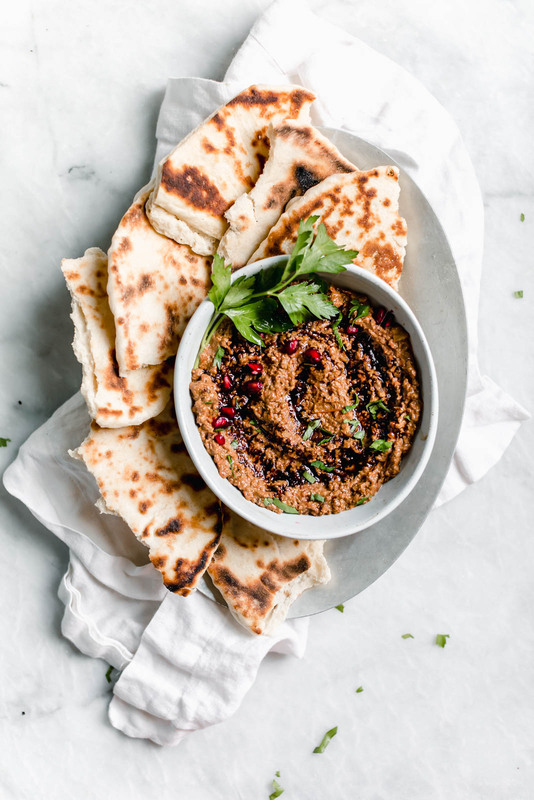 This homemade muhammara is the best dip you’ve never heard of. Made with roasted red peppers and walnuts, and sweetened with pomegranate molasses! Slice the red bell peppers in half lengthwise and remove the core and seeds. Brush the insides and outsides with olive oil, then place cut side down on the baking sheet. Bake for 30 minutes, or until peppers have some char on them and have sweated out most of their moisture. Remove from heat and allow to cool to room temperature. In a food processor or high speed blender, pulse the roasted red peppers, toasted walnuts, pomegranate molasses, lemon juice, olive oil, garlic, cumin, salt, and aleppo pepper flakes until mixture resembles course sand. You want to leave in some texture here — don’t pulse too much or the dip will become too smooth. Remove from food processor and stir in bread crumbs. Garnish with a drizzle of pomegranate molasses, pomegranate seeds, and a sprig of flat parsley. Serve alongside chopped carrots and cucumbers, crackers, or pita bread! 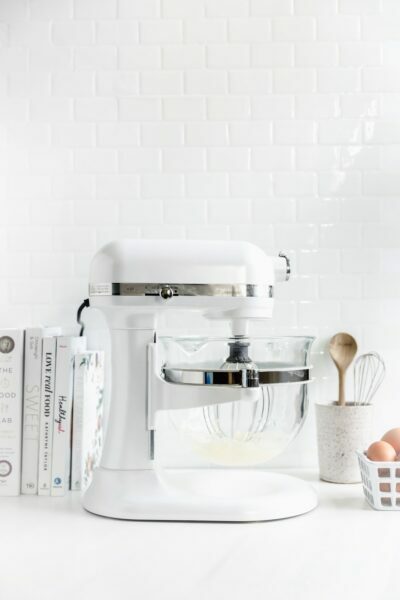 Thank you for sharing this recipe and ideas. 5 minute hummus, muhammar, cheese and crackers sounds heavenly! 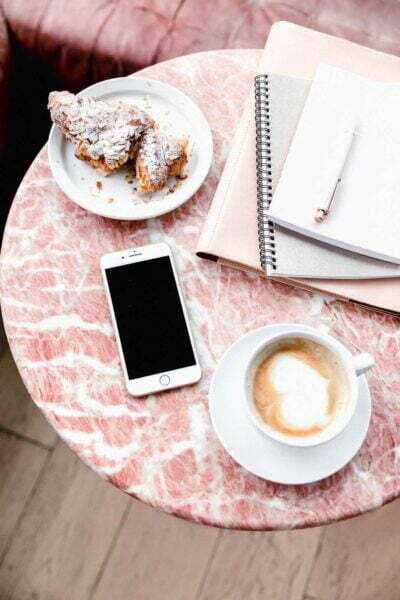 A wonderful blend of flavors to enjoy! Never had muhammara. 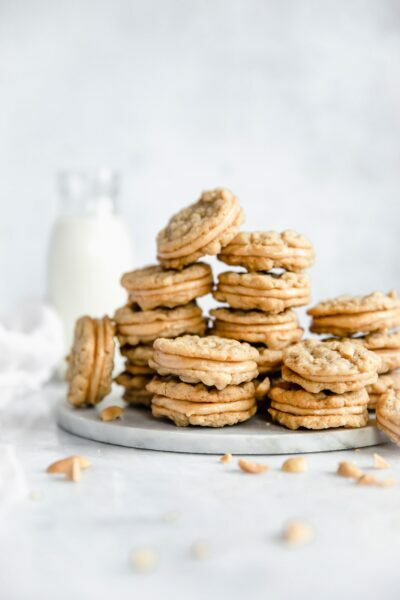 This looks so good and the recipe seems to be so easy! Trying this super soon. Gosh I am just loving this series you’re doing. Like you, I LOVE Middle Eastern cuisine and I could eat it daily. Looking forward to making this dip, Sarah! This is one of my favorite dips Sarah! I tried it a few years back when a friend made it for a party! So flavorful! Just “discovered” this a few months ago and I can’t get enough!! I can not wait to get to the market to purchase the ingredients to try this recipe. Thank you for sharing! 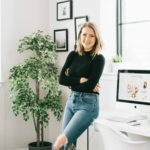 Hi Sarah, where can I find pomegranate molasses? Most Middle Eastern specialty stores carry it, but you can also substitute in regular molasses. Love this dip! I like to make dinners out of dips… totally my thing haha.